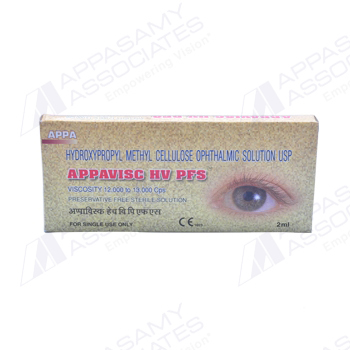 Appavisc HVPFS(Hydroxy Propyl Methyl CelluloseOpthalmic Solution USP) is a sterile, a pyrogen free clear & transparent solution of higher viscosity. It contains highly purified grade of HPMC 2% having higher viscosity.It is isotonic and non-inflammatory.Used as lubricant and protector in IOL surgery. As a surgical aid (Medical device) during cataract surgery. Maintains the depth of the anterior chamber with out the risk of the damaging the abstacle of the cornea or other with occular tissue. Available in Sterile 2ml pre-filled syringes.